• PLOT SUMMARY: Collects Invincible Presents: Atom Eve (2007) #1-2. 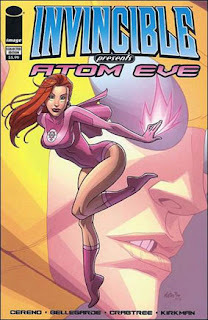 To commemorate the tragic events involving Atom Eve in recent issues of INVINCIBLE, Image is collecting her acclaimed solo series for the first time ever. See Eve's beginnings as she gets her powers and trains herself to be the hero we all knew and loved. Don't miss out a second time! Softcover (Saddle-Stitched/Stapled), 48 pages, full color. Written by BENITO CERENO. Art by NATE BELLEGARDE and BILL CRABTREE. Cover by NATE BELLEGARDE and FCO PLASCENCIA.